Wish them Shalom with this large and elegant gift basket for Chanukah that features a ìHappy Hanukkahî platter and an abundant selection of delicious treats! Wish them Shalom with this large and elegant gift basket for Chanukah that features a ìHappy Hanukkahî platter and an abundant selection of delicious treats! This gift basket is truly stunning! 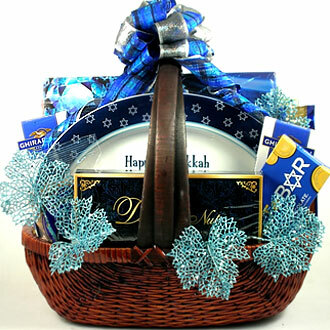 Even better, it offers a beautiful large basket filled with a large selection of treats and a keepsake Hanukkah Platter!